The second patch for Ghost Recon tweaks a bunch of other things too, including the disabling of UI elements, support for left handed mouse and keyboard players, and giving players the option to choose which vehicle drops in the game world thanks to your rebel friends. Here's the full notes for the patch which is out now on PC and coming shortly to Xbox One and PS4. As always, in co-op you'll both need to be updated to the latest version to play - and at 5GBs in size - you may want to plan your co-op session ahead of time. We received reports of some players having issues with certain missions in the game. After investigating the causes, we have implemented fixes so they can now have a smooth experience. We also fixed an XP farming exploit related to the “Rebellion Rising” mission, which created interference with the co-op experience. - Adjusted various missions markers & GPS pathfinding. - Adjusted various mission triggers in order to smoothen the player's progress and game experience. - Fixed situations where dialogue and barks would not trigger correctly. - Fixed infinite XP farming exploit on "Rebellion Rising" mission. We implemented various fixes and tweaks related to trophy and weapon packs unlocking. We also fixed an issue related to the Charactersmith model not being positioned correctly. On top of that, players who love to play with the HUD completely hidden will now be able to select the type of intel they want to collect when they interact with files or NPCs. - Players can now select what intel they want to collect, even with all the HUD options turned off. - Fixed Character hiding behind menus in certain situations. - HUD now updates when XP boosters are activated. We detected some replication issues during cooperative sessions between players. This patch should provide a more consistent experience between Ghosts sharing the same game session. - Fixed a bug where hits would register with a 0.5-second lag. - Fixed kick/ban vote notifications. - Fixed game freezes in 4-player sessions. We detected and fixed some issues that were causing some player disconnections. The experience should be more solid after the patch. - Fixed various disconnection bugs. - Fixed a bug where the user could not reconnect to a previous session. - Fixed errors when looking for public sessions. Added fixes and improvements for gameplay-related issues and requests that some players reported. Players can now select the vehicle they want to spawn when using the "Drop Vehicle" rebel skill. - Fixed XP awarded when killing an enemy undetected. - Fixed a bug where sometimes vehicle seats could stay booked after NPC exiting. - Fixed a bug where the player would take cover too far from certain props. - Players can no longer teleport to safe houses while being hunted. - The Medical Helicopter will now spawn correctly in the Tabacal area side-mission. - Fixed bikes not slowing down in water. - Fixed flash grenades not stopping detection. - Fixed an occasional instant game-over when falling off a dirt bike. - Fixed a bug where sometimes the player could not tag enemies after hot joining. - Adjusted damage caused by explosives in Arcade difficulty. - Fixed an issue where sometimes pilots didn’t die after AI helicopter crash. - Fixed a situation where sometimes vehicles disappeared when driving at high speeds. We implemented some fixes and improvements related to some audio aspects of the game, as well as the option to mute radios for those players who requested it. - Added a feature allowing the player to mute every radio in-game. - Fixed Car radio not functioning in various situations. 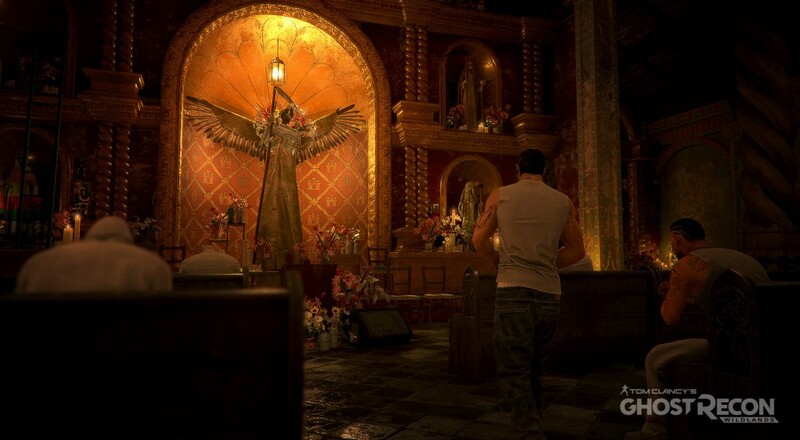 - Amplified the radio voice effects to avoid player confusing El Sueño’s voice on the radio and the one of the Ghosts. - Introduction video mix enhanced. We focused on fixing various issues in order to provide a solid experience. For stability and performance improvements, see the section below. - Fixed player models appearing with twisted limbs if they were killed in certain positions. - Fixed low-resolution textures appearing while aiming/driving. - Fixed camera clipping through some textures & props. - Fixed missing textures in certain environments. - Fixed drone showing blur effect on objects. - Fixed the textures flickering when using parachute or helicopter. - Fixed an occasional infinite loading screen after validating settings at first launch. - Fixed various world building glitches. - Fixed some world parts where the player could get stuck. - Added the SMAA anti-aliasing mode. - Added a notification for anti-aliasing recommendations in multi GPU setups. - Addressed a series of issues causing flickering in multi GPU setups. - Fixed an issue with HUD scaling in 4 monitor multi display setups. - Added support to bind Home, End, Insert, Delete, Page Up and Page Down keys. - Added several menu navigation improvements with mouse and keyboard. - Added a notification if the video driver is outdated. - Added a notification when the system is low on free RAM and starts writing to the virtual memory. - Fixed a HUD issue in co-op for users who have already completed the selected mission. - Fixed the Pitch icon display when using mouse to steer helicopters. - Fixed an issue with co-op sharing of systemic activities. - Fixed the use of Push to Talk in the co-op lobby. - Changed the Enable Controller default option to Only Gamepads. - Addressed a number of issues with the Steam Controller icons and functionality. - Addressed a series of random crashes encountered by users. - Fixed an issue causing framerate drops when the saving icon was being displayed. - Fixed an issue where the menu was lagging while running the game on a Hard Disk Drive. - Solved an issue with VRAM bar update when lowering Resolution scaling. - Fixed a bug on the Medication Air Transport mission in Tabacal. - Fixed an issue with character poses in Ansel. - Solved a controls issue where one couldn’t sprint from crouch or prone position.